It’s hard to believe that this semester is actually drawing to a close. Time since the winter seems to have flown by, and here, all of a sudden, is April. There’s a lot on my plate between now and mid-May, including finals and end-of-semester projects, lots of weekly meal plans for clients, freelance work, and recipe development (!) for the new cookbook. So, between now and the summer, my everyday eats will have to be simple above else. 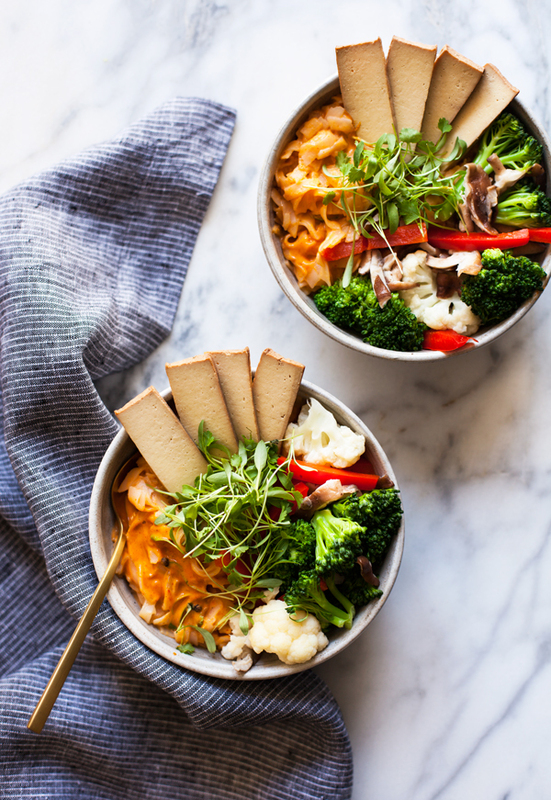 These quick & easy red curry nice noodle bowls are a great place to start: an efficient, balanced bowl meal that’s as flavorful as it is fast. The process here couldn’t be easier: boil water, let the rice noodles soak, and steam whatever veggies you’ve got. 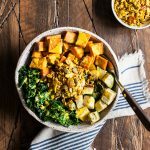 Chop up some tofu: it could be store-bought, seasoned tofu, like the smoked tofu from SoyBoy or the marinated, baked tofu varieties from Fresh Tofu Inc or Wildwood. I use these a lot when things are really busy, and I find them to be a time-saving, flavorful addition to my meals. 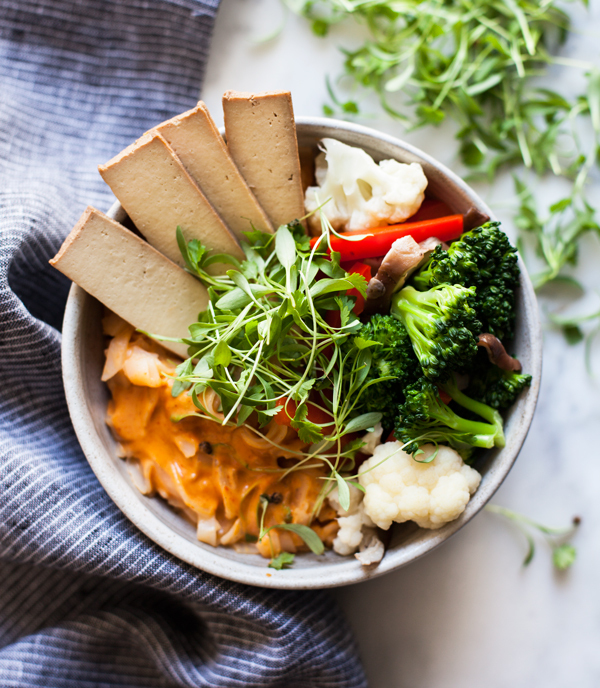 Of course, you could also use plain cubed tofu in this recipe, if you don’t need to dress tofu up to enjoy it, or you could try an easy homemade marinade. My lemon pepper tempeh cubes will also be great in the recipe if you have the time. If tofu’s not your jam, try adding some edamame, mung beans, chickpeas, aduki beans, or another legume to the dish for some vegan protein. Whisk your sauce together, dress the noodles, pile the ingredients in a bowl, and you’re good to go. Whisk together all dressing ingredients and set the dressing aside. Get your veggies and rice noodles ready. Steam or blanch the bell pepper, broccoli, cauliflower, and mushrooms. Bring a pot of water to boil. As soon as it's boiling, remove it from heat and stir in the rice noodles. Allow rice noodles to sit for about 3 minutes. Drain the rice noodles and mix them with about ¾ cup of the curried peanut sauce, till they're nicely coated. Divide the noodles into four bowls. Top each with a quarter of the vegetables and the tofu. Spoon an extra tablespoon or so of dressing (and some sprouts, if desired) on top of each bowl. Serve. 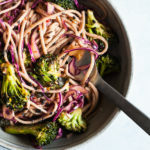 In place of the rice noodles, you can cook 4 servings of soba noodles, udon noodles, mung bean noodles, aduki bean noodles, black bean noodles, or another noodle of choice! It would be a lie to say that this recipe isn’t all just a tasty vehicle for sauce. And this curried peanut sauce is a new favorite–and possibly a new obsession. It is all things salty, sweet, spicy, and delicious, and after making the noodle bowls yesterday I just went ahead and made another batch. 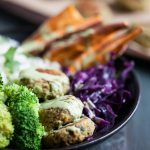 I’m hoping that this recipe will rescue you on a busy afternoon or evening soon. It’s easy to cut the noodle or veggie portions in half or adjust them to serve one, if you’re dining solo. But no matter what, I highly advise you to make all of the sauce. You won’t be sorry! On that note, friends, I’m off. I’ll see you this coming weekend for a new roundup of weekend reading links and recipes. Have a wonderful end of the week! I never thought to mix rice noodles with red curry! I use it in my Thai fried rice and soup dishes all the time but never with noodles. Looks amazing dear! These are simply gorgeous. Even though it’s getting warmer, I’m still craving hearty dishes like curries and bowls. I don’t think I can ever get tired of them! 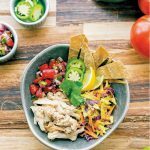 These look yummy You have so inspired me to make bowls for my lunches lately, and the kids love them too. I really appreciate that you still have time to blog despite all the other stuff you do. Thanks! So perfect! 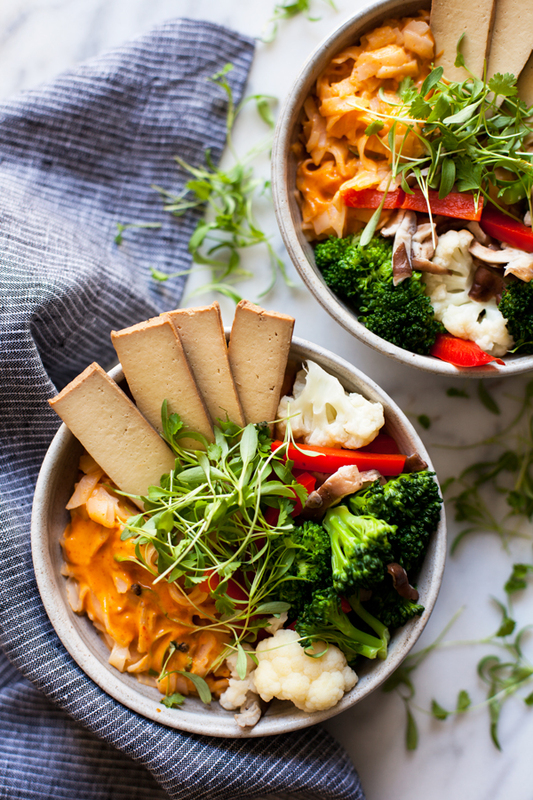 Definitely my kind of bowl :):) Good luck with the end of semester, I am in the same place right now and totally get how these quick dinners are life savers! Haha, it’s hard to resist, right? I made more of it almost immediately. Too good not to 🙂 Enjoy the bowls, Miranda! I really like the recipe & its ingredients are so healthy. Although its my first visit here but I’m really inspired by your recipe. Thank you so much. I’ll try it soon. I’ve never had red curry before, but this recipe is just so beautiful I need to try it asap! I’m absolutely loving this!